Want it delivered by Saturday, Apr 20? Order in the next 5 hours and 32 minutes and select FedEx Saturday . Or give us a call at 1-800-625-5468. My Passport X from WD expands your Xbox One or PC gaming experience. Connect this portable and powerful drive to immediately add storage capacity to your system. My Passport X from WD expands your Xbox One or PC gaming experience. Connect this portable and powerful drive to immediately add storage capacity to your system. 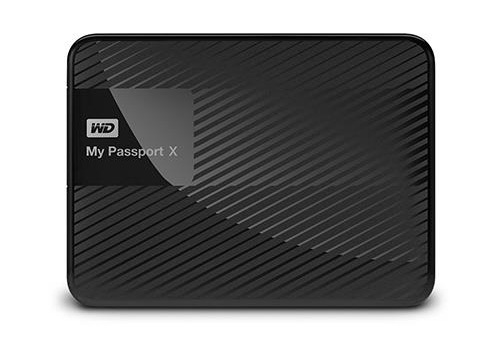 Built around a high-quality WD drive, My Passport X is performance-tweaked to meet the desires of serious gamers. Take your gaming titles wherever you want. You can even plug it into your friend's Xbox One™ video game system and it's game on! * Internet required. Must be logged into your Xbox Live online account. * If game was purchased and loaded from disc, original discs may be required to verify ownership. Connecting My Passport X to your Xbox One is like equipping your gaming avatar with super-lifting strength and speed. It gives you the room to store a lot more games, plus the speed of a USB 3.0 compatibility for a lightning-quick gaming experience. It's built to deliver a great gaming performance for Xbox One or PC gamers. My Passport X takes just minutes to set up. Plug it in, follow the easy on-screen instructions -- and you're locked and loaded to take on armed marauders, aliens and opponents of all types. An ideal companion for your Xbox One, the My Passport X's stylish, compact design allows you to take your gaming lifestyle with you – and look good doing it. Anywhere, Anytime - Take your gaming titles wherever you want. You can even plug it into your friend's Xbox One video game system and it's game on! (Internet required. Must be logged into your Xbox Live online account. Original discs may be required). Performance Tweaked! - Connecting My Passport X to your Xbox One is like equipping your gaming avatar with super-lifting strength and speed. It gives you the room to store a lot more games and USB 3.0 compatibility for a lightning-quick gaming experience. No Sweat Setup - My Passport X takes just minutes to set up. Plug it in, follow the easy on-screen instructions -- and you're locked and loaded to take on armed marauders, aliens and opponents of all types. Sleek Design with High Capacity - An ideal companion for your Xbox One, the My Passport X's stylish, compact design allows you to take your gaming lifestyle with you - and look good doing it. Ultra-Fast Transfer Rates -The power of USB 3.0 lets you access and save files in blazing-fast speed. Plus, no separate power supply is necessary.